(Dallas / Ft Worth, TX) The Wally Jolly Christmas Show came to Dallas/Fort Worth at Cottonwood Creek Church in Allen, Texas on Friday, November 30th. 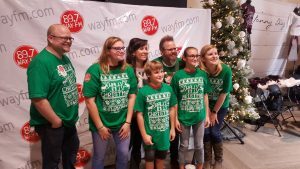 Beginning as a seasonal spectacle in several WAY-FM markets in 2014, The Wally Jolly Christmas Show was reimagined for 2018 with new skits and games from Wally and his morning co-hosts Bekah, Zach, and Betty Rock. Joining the evening were musical guests Jonny Diaz and Northpoint Inside Out. The church’s artist-in-residence, Bridgette Hammers, opened the near-capacity night. “To the stage the crowd was responsive and leaning in. When one-on-one, the families, to a person, felt a strong, personnel connection with Wally and the gang. To see the connection in action is compelling. It was a family event and the age span and mix was dynamic! It is clear that the new 89.7 WAY-FM DFW audience is engaged with the WAY-FM brand of uplifting, upbeat and real.”, noted President/CEO John Scaggs.